Get your glitter on and your rainbow flag flying – this weekend is all about Pride. If you’re heading into town to party, watch the parade, or just soak up the atmosphere, be sure to plan ahead and find somewhere to eat. If you’re looking for something extra special, here are six West End restaurants serving up rainbow dishes and drinks all weekend long. The Ivy Soho Brasserie is kicking things off with a fabulous brunch hosted by some of London’s best-loved drag queens. From 11am to 4pm, Tiffaney Wells and friends will be performing fun-loving hits while diners enjoy dishes like eggs Benedict and an indulgent truffled chicken sandwich. If you’re visiting later in the day, don’t miss their Pride of Soho cocktail – a blend of gin, grapefruit juice, Crème de Rose and hibiscus syrup, served in a golden coupe. Their terrace – a top spot for people-watching – will be decked out with colourful flowers, balloons and butterflies. 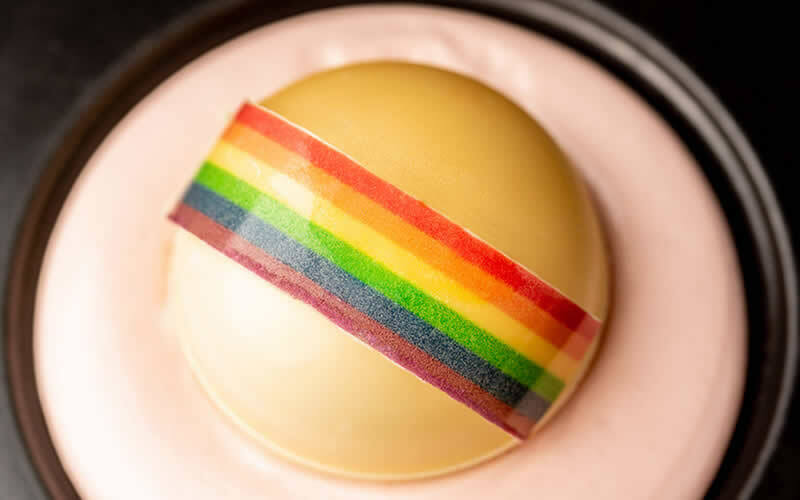 Grab a table, soak up the sun, and order the Strawberry Pride Melting Dome – a rainbow-topped white chocolate dome that melts to reveal fresh strawberries, meringue and honeycomb. Peruvian-Japanese restaurant Chotto Matte is throwing a free Rainbow Pride Festival this Saturday with music, cocktails, and a brand new rainbow menu. 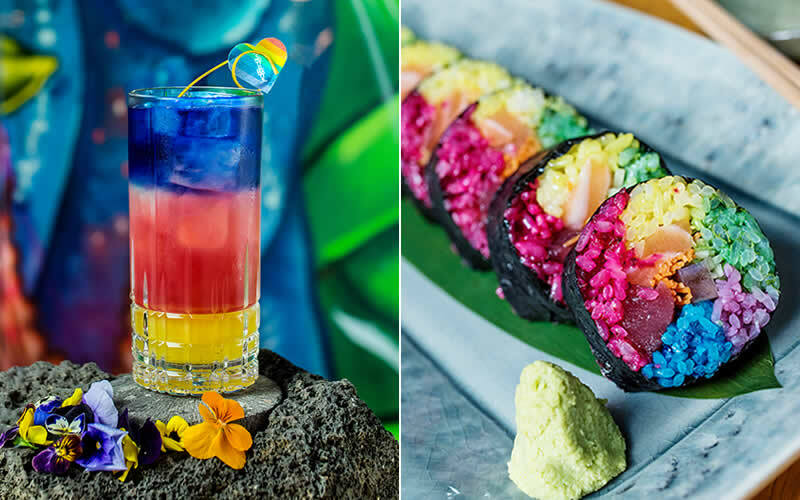 Available until the end of July, the menu includes Sailor Jerry rum cocktails and a colourful selection of sushi rolls, dragon rolls, yellowtail gyoza and mochi balls. £1 from every dish sold will be donated to LGBT charity London Friend so come hungry and get stuck in! 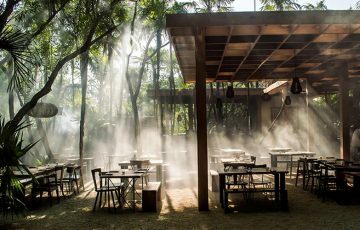 As an extra treat, guests can enjoy dishes and drinks on the house for an hour from midday. 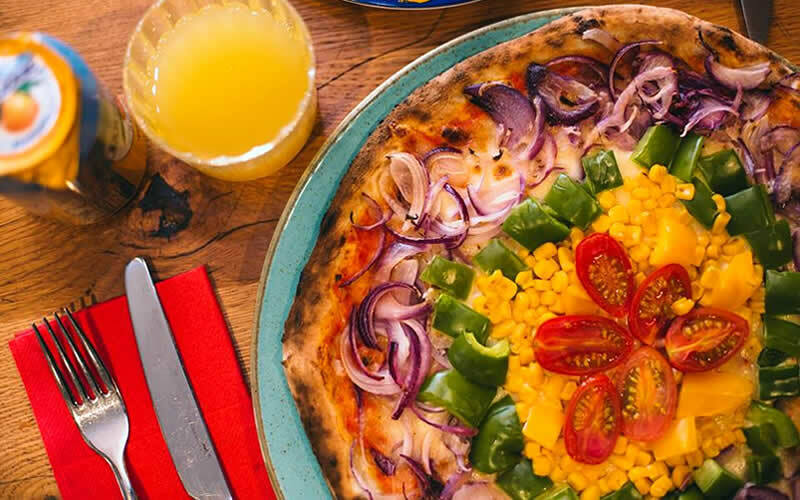 If you can never resist a good pizza, book a table at BungaTINI and tuck into their 12-inch wood-fired Pride special. It’s topped with fresh veggies in all the colours of the rainbow, so it probably counts as one of your five-a-day. After an Aperol spritz or two, you’ll be ready to party long into the night. 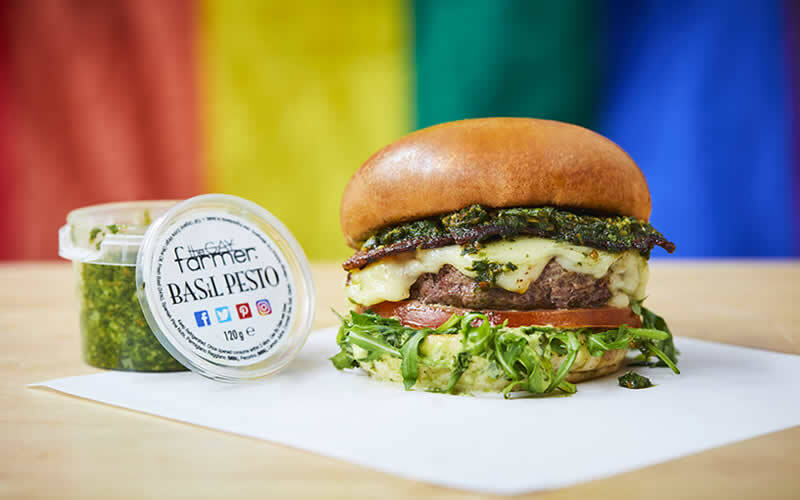 Honest Burgers have teamed up with The Gay Farmer to bring back the Pride burger – a beef patty topped with smoked bacon, mozzarella, pesto, garlic mayo, tomato and rocket. The pesto is like nothing you’ve tasted before – Mark (The Gay Farmer) uses organic olive oil from his mother’s farm in Spain, along with pine nuts, aged parmesan, pecorino, Amalfi lemons, French garlic, Cornish sea salt and basil. 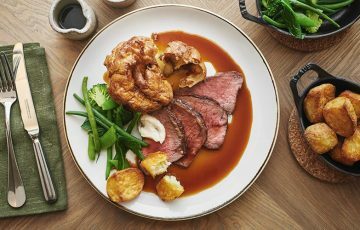 It’s on the menu until the end of the week at their Soho and Oxford Circus restaurants, priced at £12.95, including rosemary salted chips. Last year they raised £1,875 for LGBT charity Stonewall and they’re hoping to smash that total this weekend, so round up your pals and grab a burger for a good cause. Looking for the perfect pastry to enjoy before the parade starts? 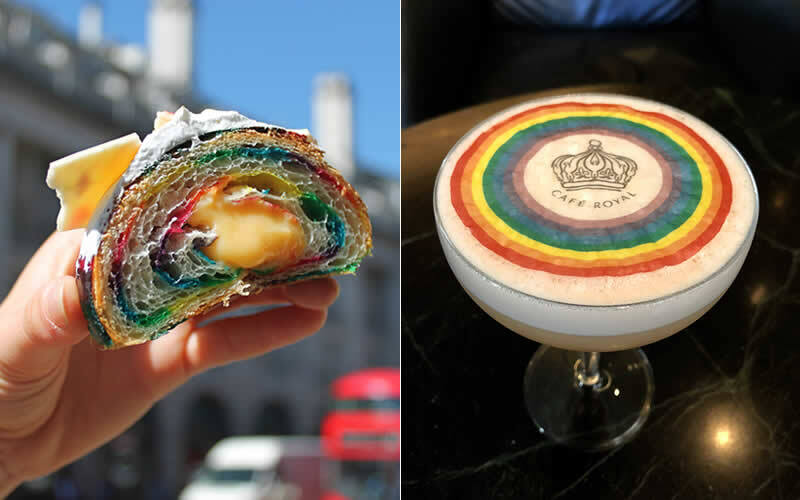 Hotel Café Royal is bringing back their Insta-famous rainbow croissants, filled with lime curd and decorated with meringue and white chocolate. They were created by head chef Romain Tessier, who you might recognise from Bake Off: The Professionals. They’re available exclusively from Papillon until July 15th. If you want to escape the bustle of Regent Street, the hotel’s glamorous Green Bar is a top spot for cocktails. This weekend they’re serving a ‘LDN Pride’ cocktail made with Absolut Elyx, apricot liqueur and rhubarb bitters. You can snack on cheese and charcuterie or stay for dinner at Laurent, the hotel’s new grill restaurant and sushi bar. Can’t face the Soho crowds? 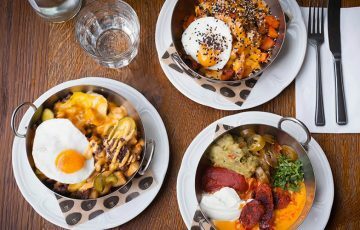 Head to Covent Garden for tacos, tostadas and tequila at modern Mexican restaurant, Cantina Laredo. 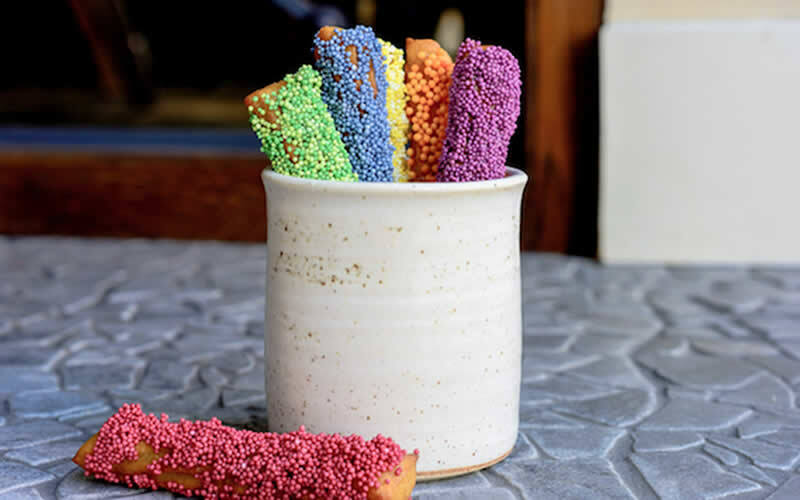 They will be proudly flying the flag on Saturday with their rainbow churros – guaranteed to add some technicolour sparkle to your Pride celebrations. Don’t forget – if you’re out in the West End this weekend, you can use the OpenTable app to find and book restaurants nearby.